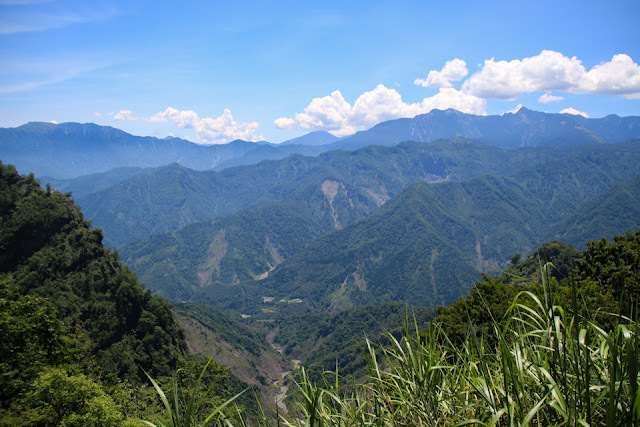 living in the bustling city of Taipei, sometimes it's easy to forget that the majority of Taiwan's land mass is mostly uninhabited mountains and forests. 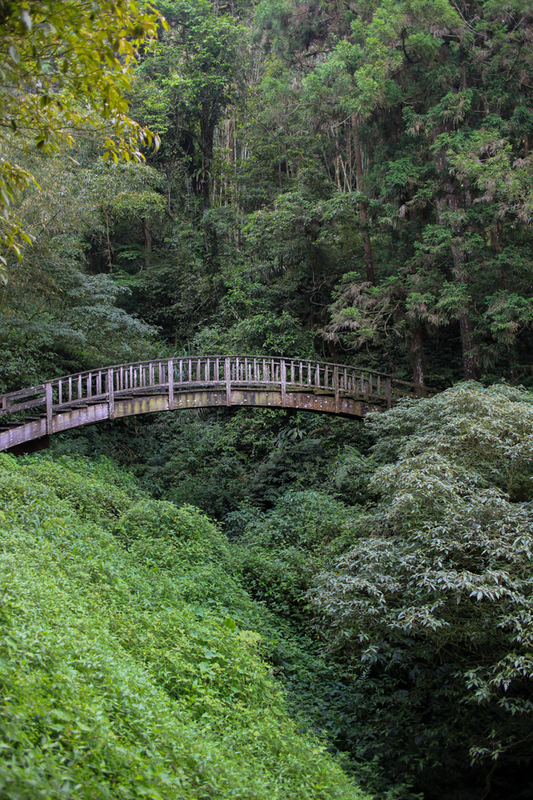 but one of the best things about this island is that magical places like Alishan National Forest exist, only hours from the concrete and chaos. last summer we took a long weekend there with our friends, their one-year-old daughter, and their dog. 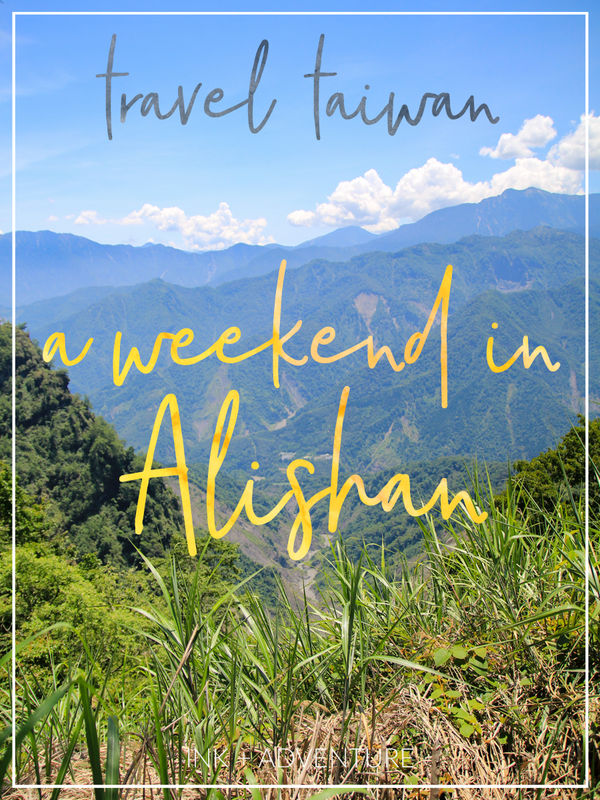 Husband and I took the train down to meet them in Hsinchu, and we road tripped from there to Chiayi, and on to Alishan. 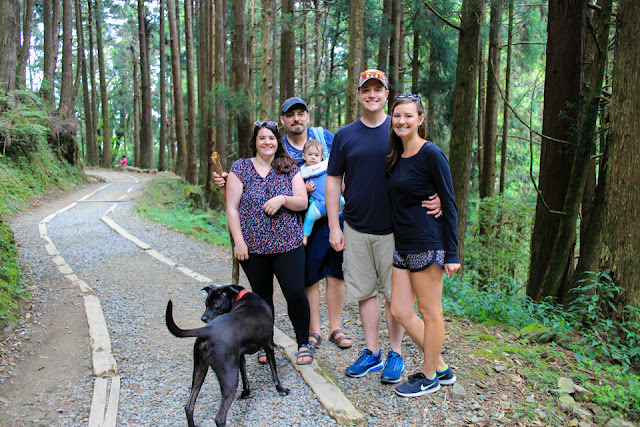 since our friends needed a pet-friendly place to stay, we found a cozy b+b outside the town of Fenchihu. actually. we got lost trying to find it because google maps didn't want to recognize the name in English and we couldn't read the Chinese. we tried to check into the wrong place first. but thankfully the people of Taiwan are friendly and helpful, and several phone calls later we made it to the correct homestay. 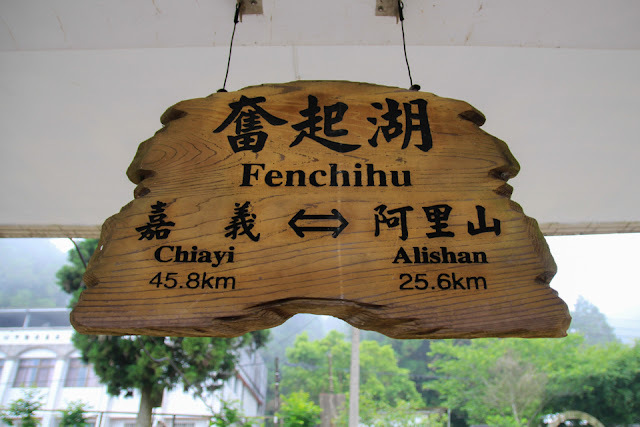 a lot of visitors stay in the Fenchihu area because it's cheaper than the handful of hotels inside the park, and it's end of the line on the scenic railway from Chiayi. 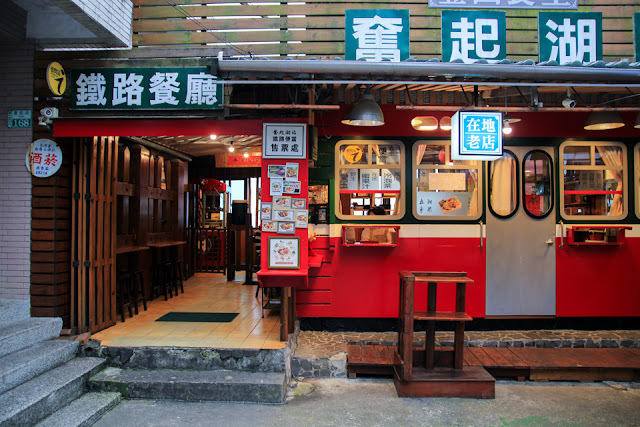 there is an "old street" with tons of cute shops and food stalls, a railway museum, famous bento box restaurant, and hiking trails through bamboo forests and nearby tea farms. we explored a part of the Fenrui Historic Trail, which you can hike for several hours between small mountain towns. 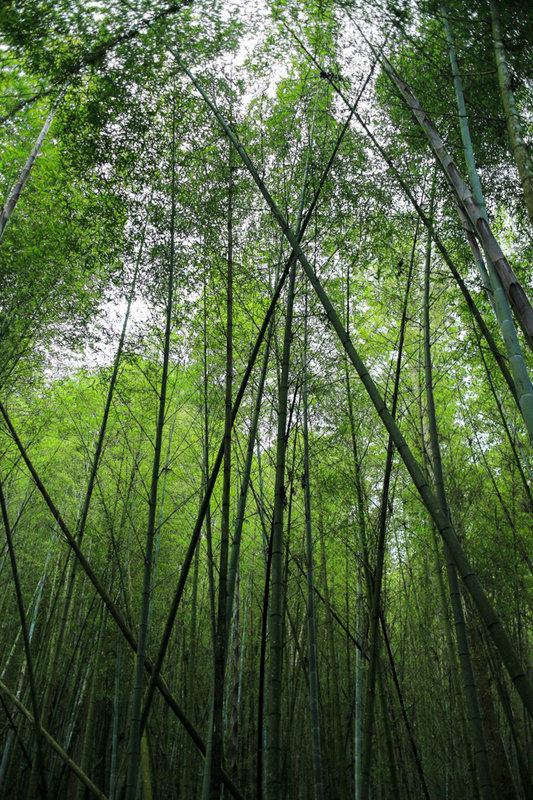 given that we had a dog and a baby in tow -- and dinner time was fast approaching -- we opted for a short stroll through the bamboo forests near town. it was misty and moody and gorgeous. but best of all: quiet. the next day we ventured into the national park. 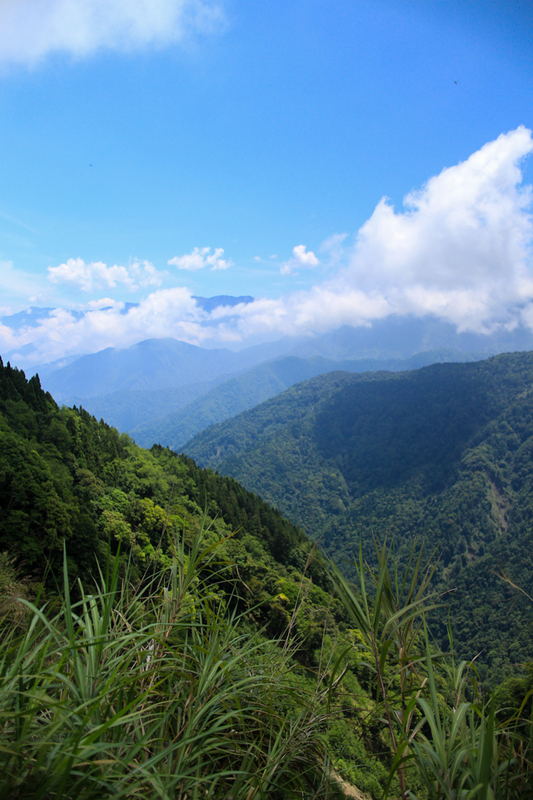 there are endless trails to hike, but the best views are likely to be found at the summit of the Zhushan Sunrise Trail. 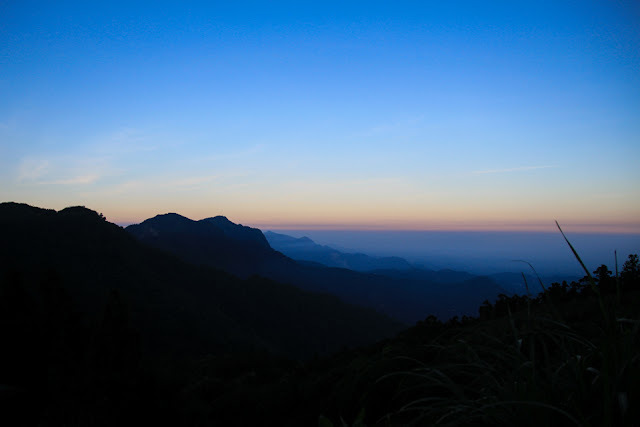 this platform is the place where crowds of tourists flock to see the "sea of clouds" which [depending on the weather] floats between the mountain valleys at sunrise. the weather for our visit was not looking to cooperate... and also waking up at 3am was not sounding appealing. 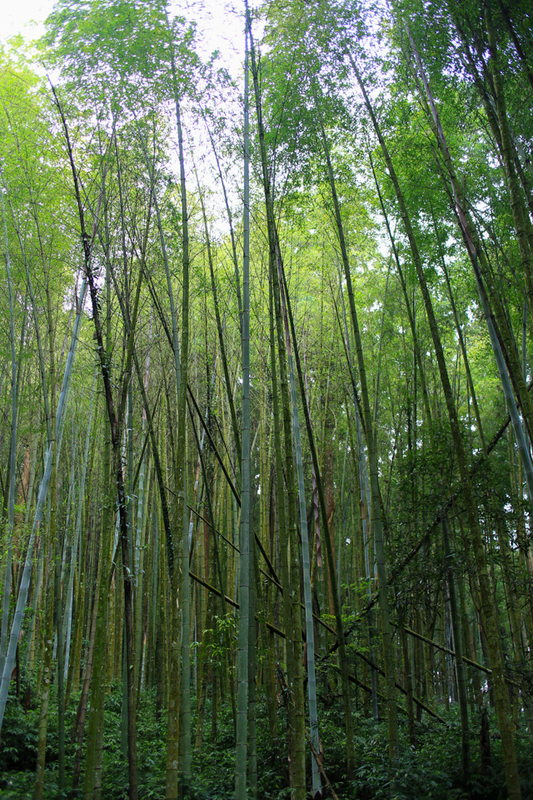 but the forest is still full of sights to see during the day. 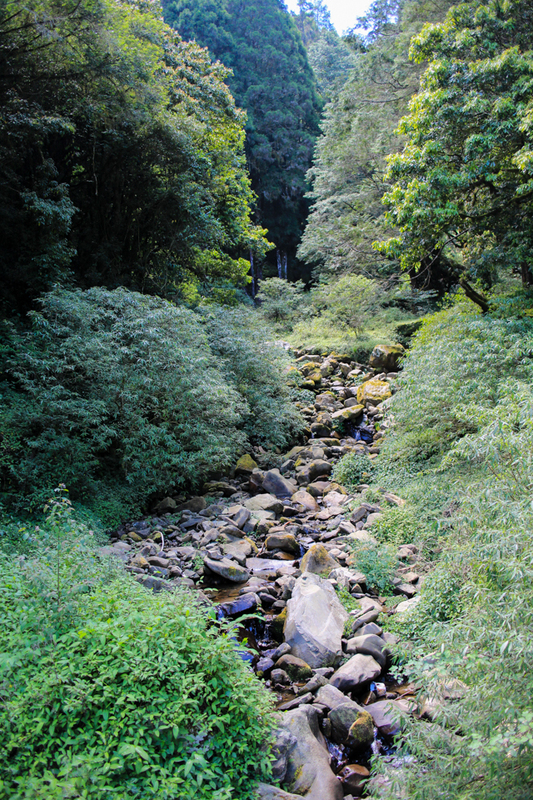 within Alishan National Scenic Area there are giant trees, temples, waterfalls, lakes, and cultural activities to explore. 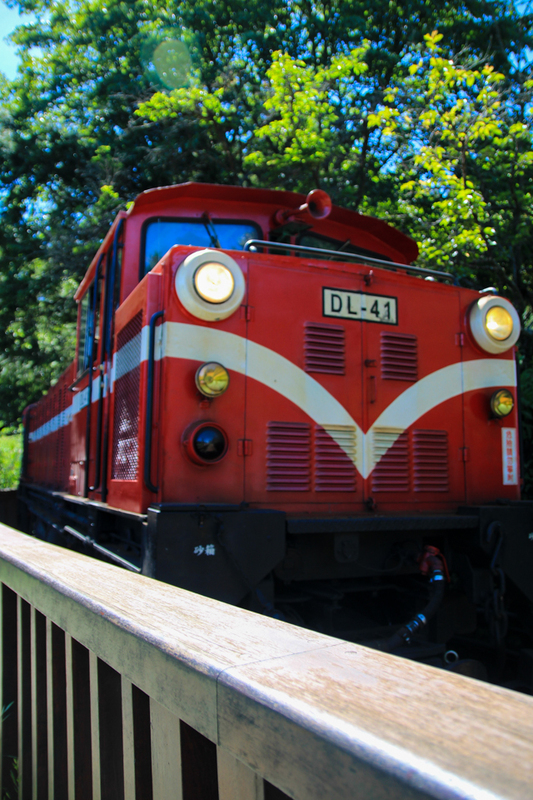 you can also ride a branch of the historic rail -- an old logging line that runs the iconic red train seen on magnets and postcards everywhere in Taiwan. near the main parking area and the Alishan Forest Rail station, there is a complex of shops and restaurants you can visit. 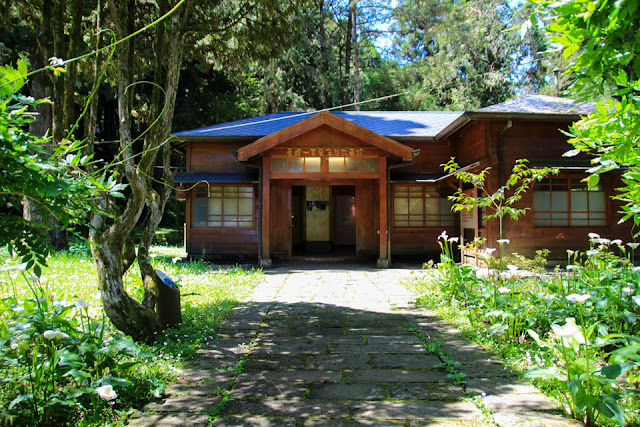 plenty of local fare is available, as well as the ubiquitous 7-11. we fueled up on lunch here before taking one of the walking trails out through the forest. 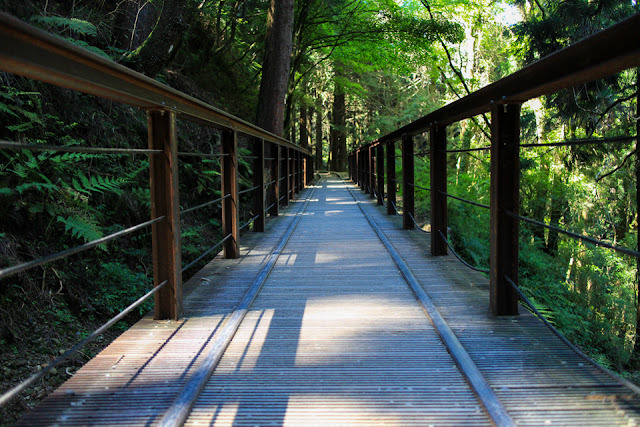 from here you can also hop a shuttle bus to some of the more remote areas of the park. our second morning, we still didn't make it out to the official sea of clouds. 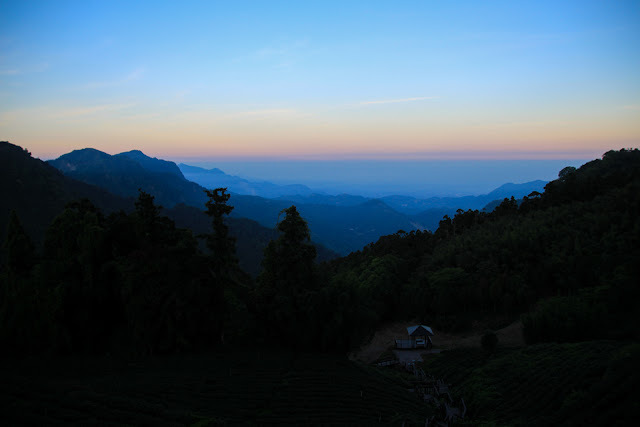 but I did pop out of our homestay to catch a bit of sunrise over the mountains and tea fields. 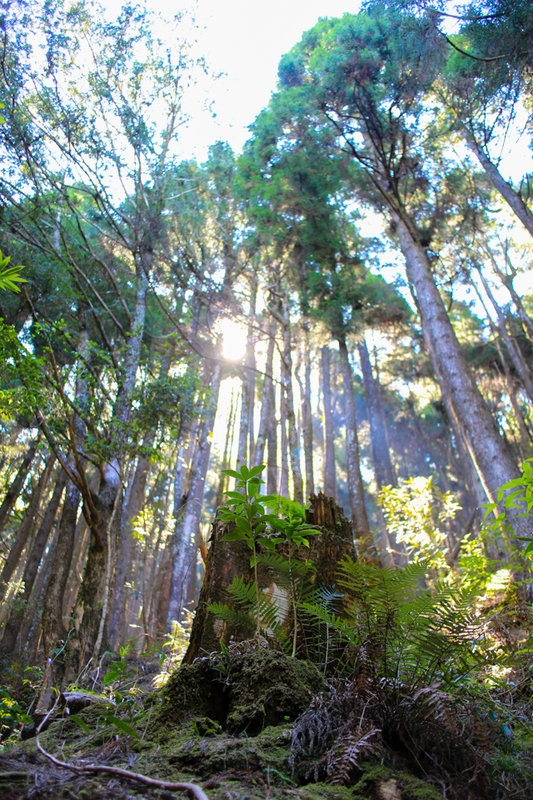 we packed up the car, then we were off to the forests again. 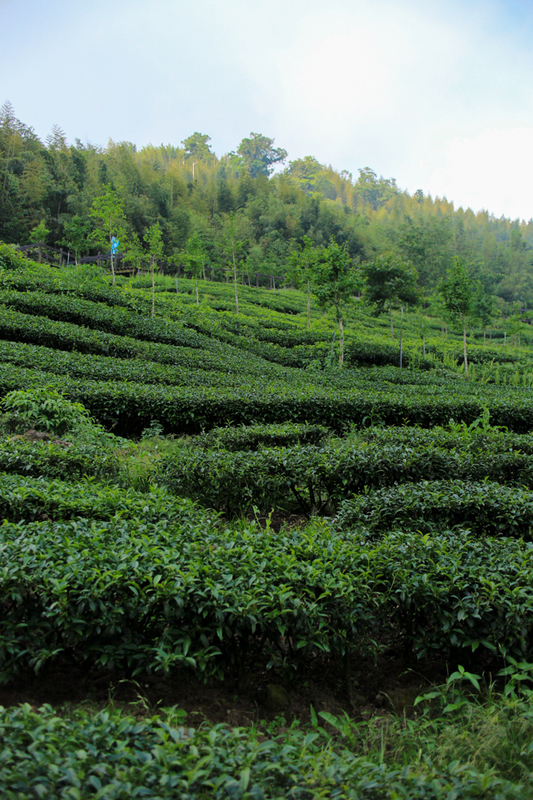 most of the official Alishan Park area can be seen in a full day, and there's plenty more trails to explore in the surrounding mountains and tea plantations. 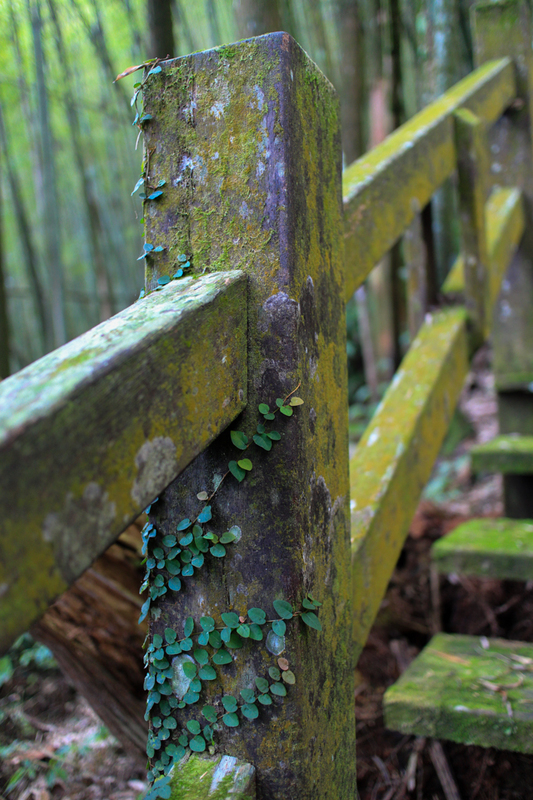 so we opted to drive past the National Scenic Area and explore the Tefuye Historic Trail. 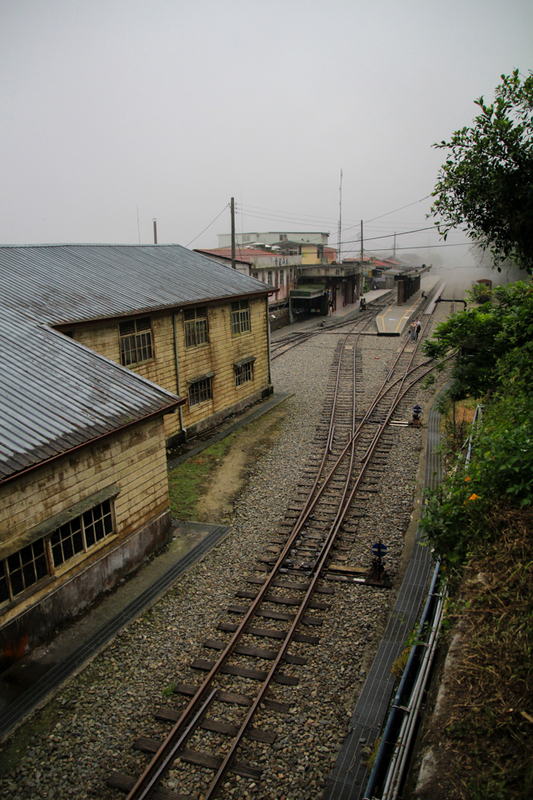 the Tefuye Historic Trail is an old railway that has been converted to footpath, running between the mountain villages of Zihjhong and Dabang. 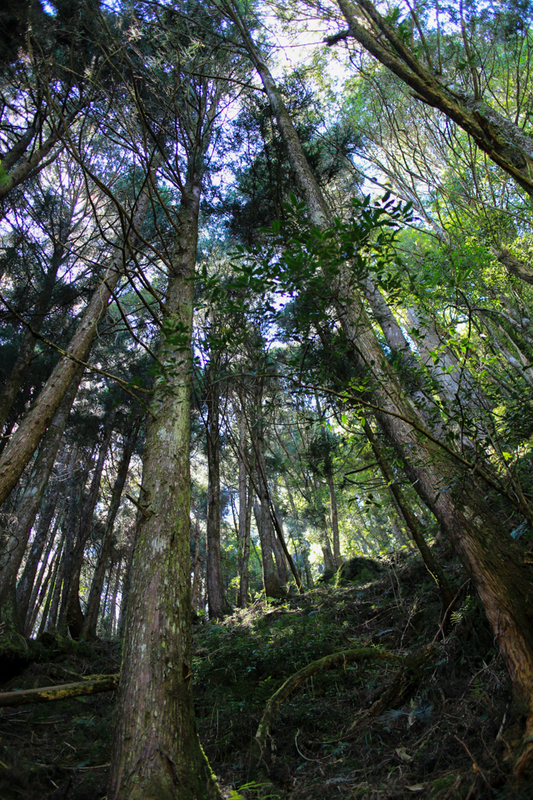 winding beneath shady trees in the forest, the trail is mostly flat and about 6km one way. 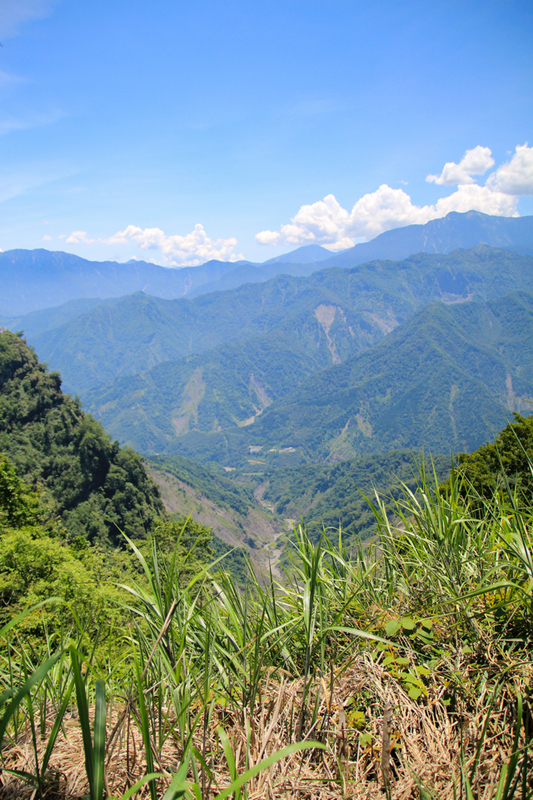 as we had to drive back to Hsinchu that afternoon, we walked out for about an hour before returning. the trail is more remote [not much public transit access] but if you have your own wheels and the time to spare I would highly suggest it. the forest was lovely, and parts of the trail even have the original rails still in place. it also doesn't hurt that the trailhead offers incredible views of the surrounding mountains. 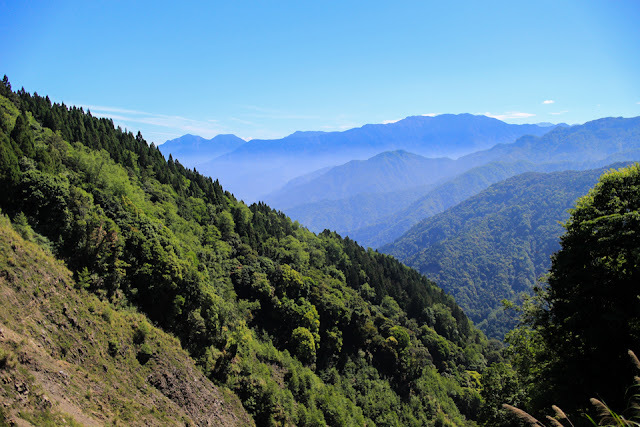 Alishan National Scenic Area is one of the most-recommended travel destinations in Taiwan, but also one of the more difficult to get to. 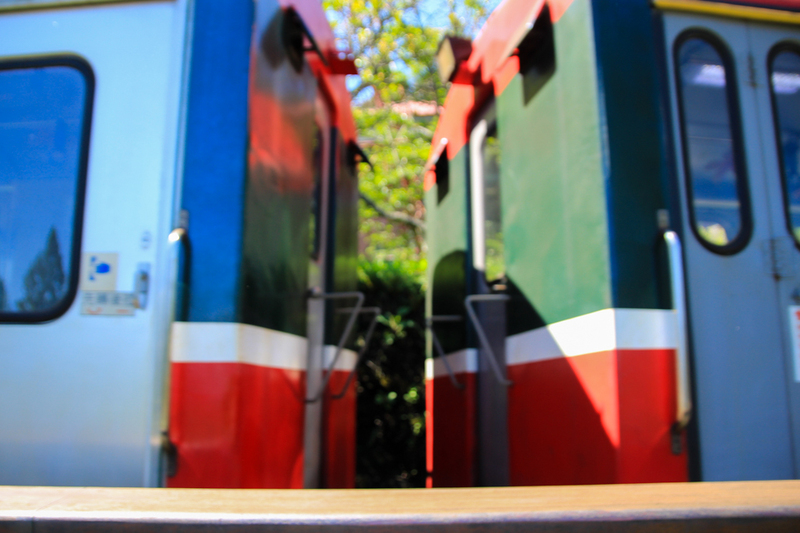 you can easily reach Chiayi by the high speed rail, but once you are there, things can become complicated. 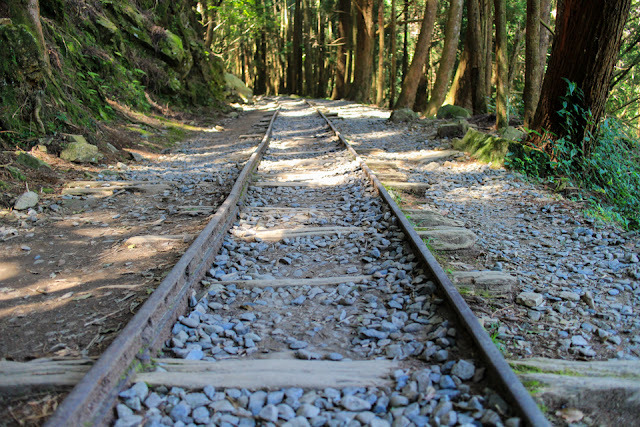 originally, tourists were able to ride the historic rail all the way from Chiayi to Alishan. 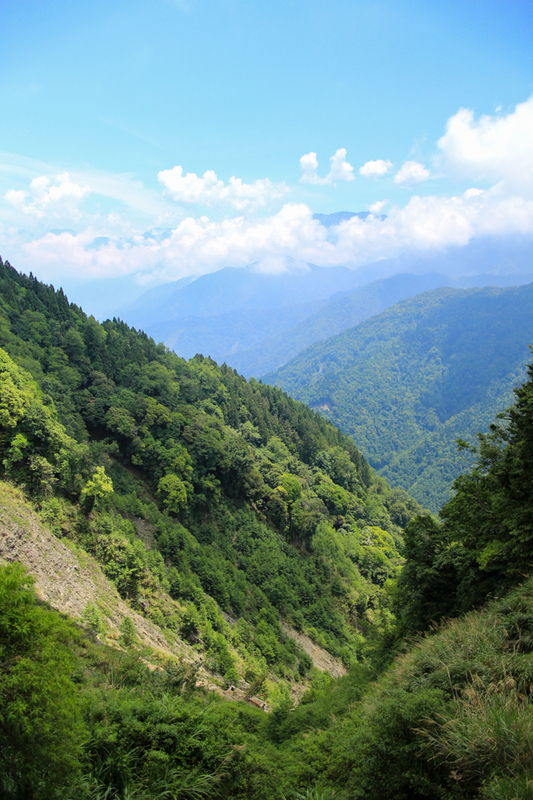 now [thanks to typhoon damage] the section between Fenchihu and the National Forest is closed, and you will need to take a bus to go between. the train runs only once or twice a day. tickets can be booked online, but they sell out very fast. spending the weekend in the mountains with friends was just the refreshment we needed. after a week of cold and rainy and grey weather best suited to curling up on the couch under a blanket, I'm happy to report that the sun has finally made an appearance again in Taipei. I just got back from a long walk and it felt a-ma-zing to have sun on my skin. they say March weather is in like a lion, out like a lamb but I've always found it to be all over the place from day to day, rather than a smooth progression. but I have been trying to get out more, even when the skies are grey. a friend of mine is in town and yesterday she suggested we hike Elephant Mountain -- despite the weather I can't really complain about spending time together and being out in nature. and in a few days my mother-in-law is arriving for a three week visit. so it seems I need to charge up my camera batteries and get ready for some adventuring. in other recent[ish] news... 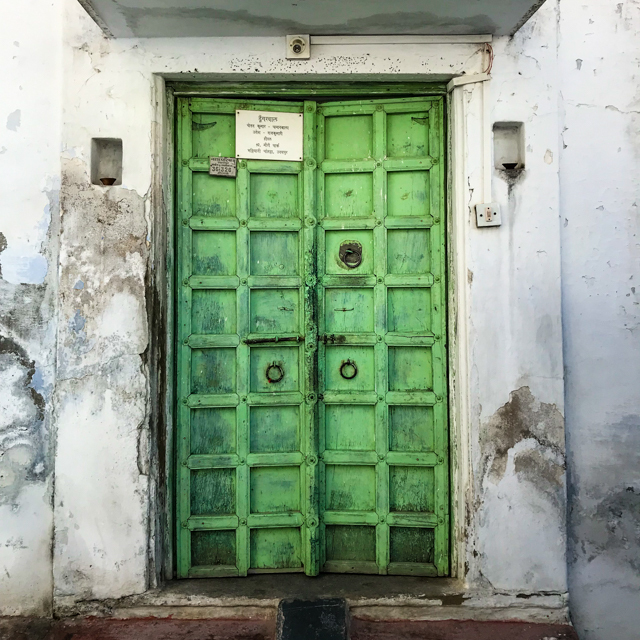 I went to India. it was loud and beautiful and crowded and smoggy and colorful and uncomfortable and humbling and absolutely, utterly delicious. India was all of those things. 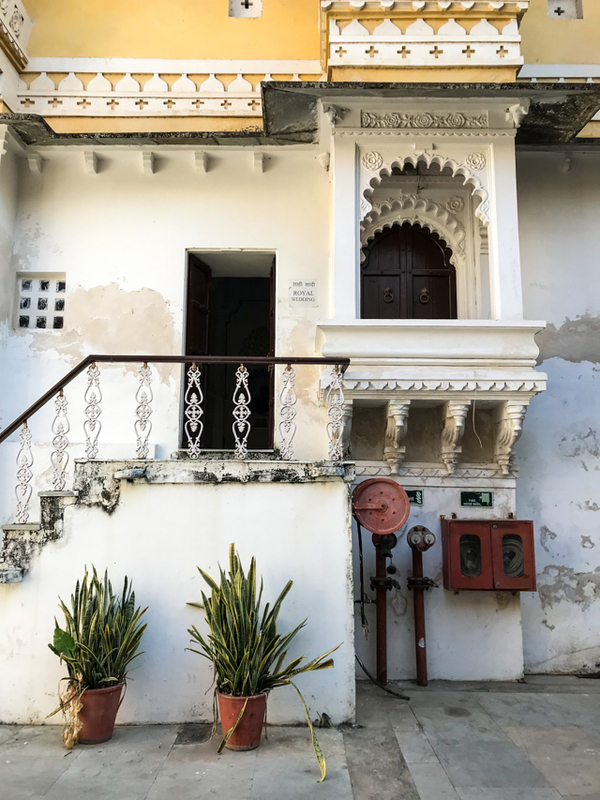 India was everything, all at once. 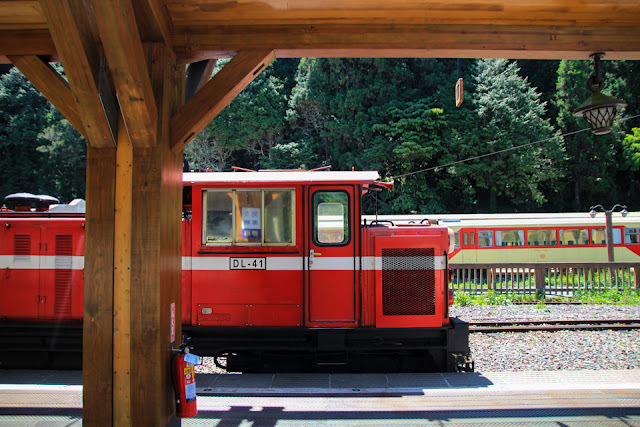 a part of me feels like a "bad" travel blogger because I did not even take my camera with me [gasp!] but in truth, we didn't really go to see India -- we went to celebrate two amazing people marrying each other over New Year's. 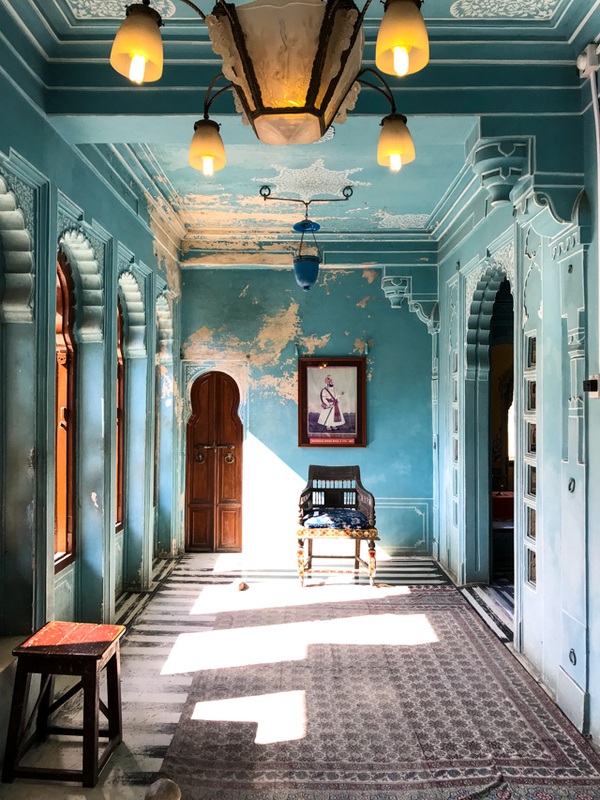 I got to stay in a palace and dance like a bollywood star and eat all the delicious things. I saw donkeys and horses in the street, a guy riding an elephant through a traffic circle, cows literally everywhere, camels and monkeys and even a wild mongoose. 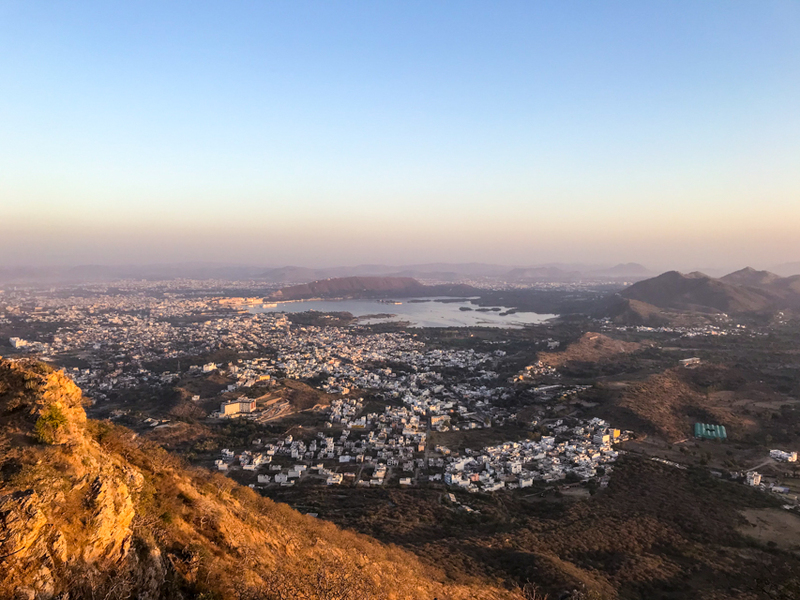 it was actually pretty nice to just let our time in Udaipur be what it was. we spent most of our non-wedding activity days walking around the city. and eating. 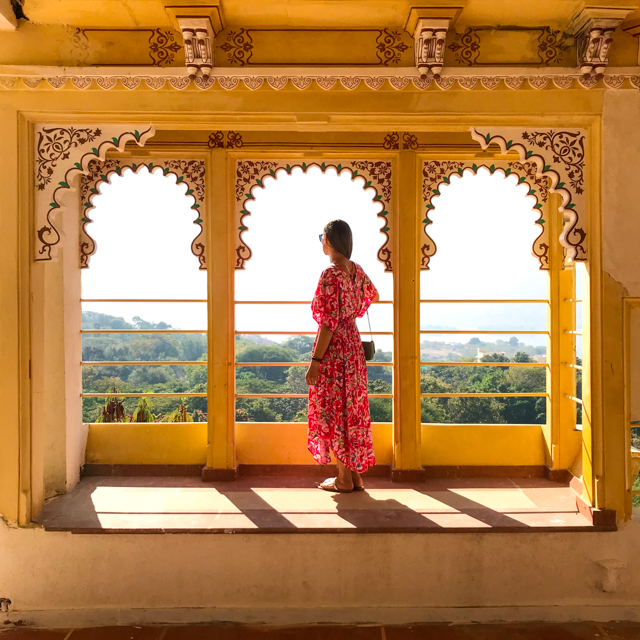 we took a complicated journey out to the Monsoon Palace for sunset, braved the crowds at the City Palace, and went shopping for traditional outfits... but mostly just ate. 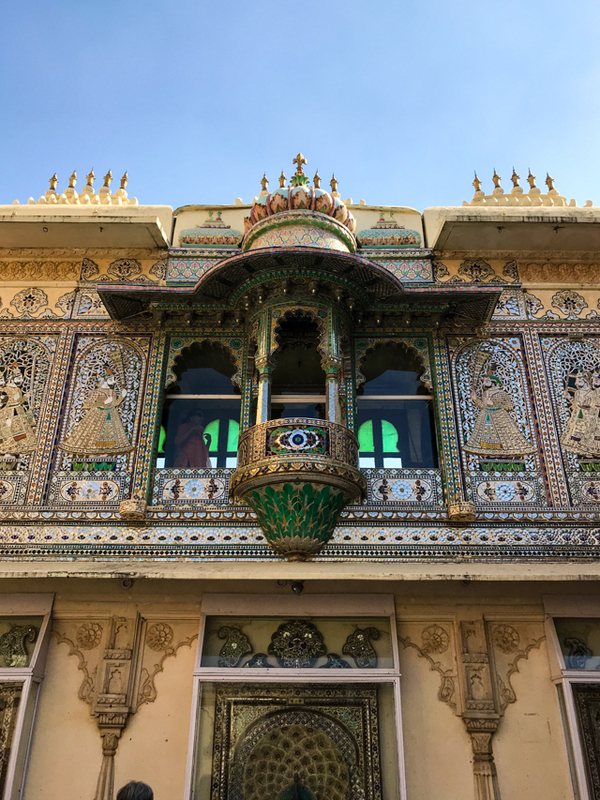 I don't have a city guide or even a packing list to share -- or anything other than a handful of phone photos -- but I can tell you that India was both one of the most incredible and challenging places I've ever visited. to be honest, I'm still a little bit in awe that I actually went to India. 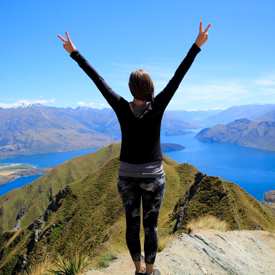 it's not a country I had on my bucketlist or ever really saw myself visiting. as someone who has issues dealing with too much dirt, or noise, or crowds... it got to be pretty overwhelming at times. I would still say the trip was worth it. [it's tempting to say so for the food alone -- I'm seriously craving poha and papadams after writing this.] but we had a wonderful reason to visit and I'm glad we had the chance. 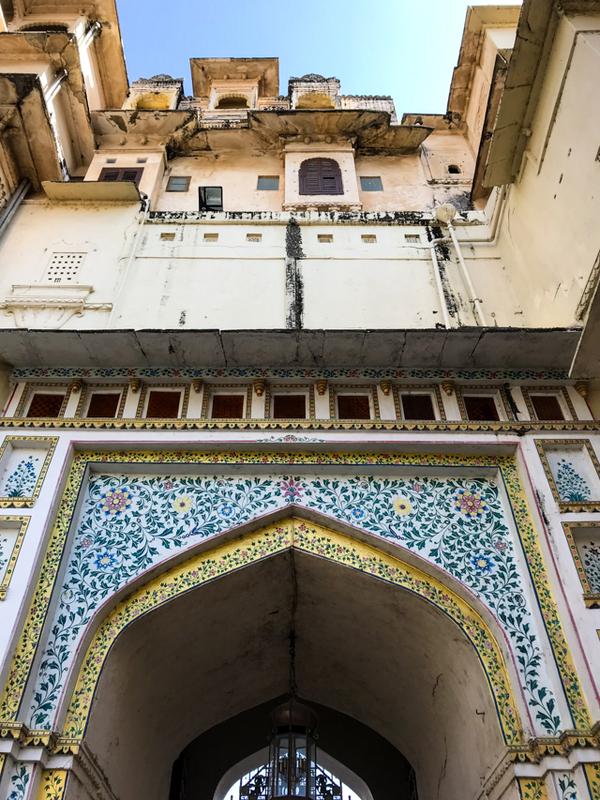 there's a lot of India to see and we only experienced a slice. but I think for us, for right now, it was just the right amount. 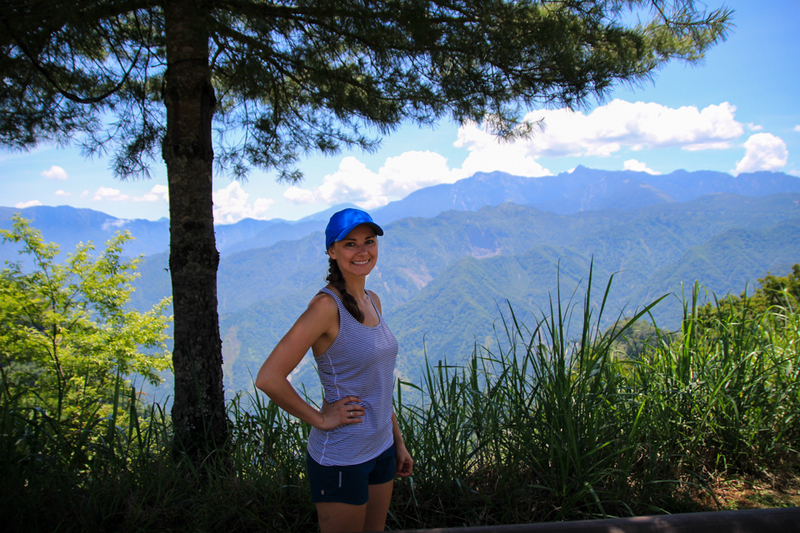 I'm Jamie: coffee addict, author in progress, and American expat living in Taipei, Taiwan. I'm a photography nerd, wine lover, and occasional runner. I spend my free time chasing dragons. ink + adventure is where I share my journey - you'll find travel photos, expat experiences, and bits about life as a blogger/writer living in Taiwan. read more about me here, or subscribe to the blog below. all photos and writing posted on this blog, unless otherwise noted, are my own work. please give credit + link back when sharing. thanks!